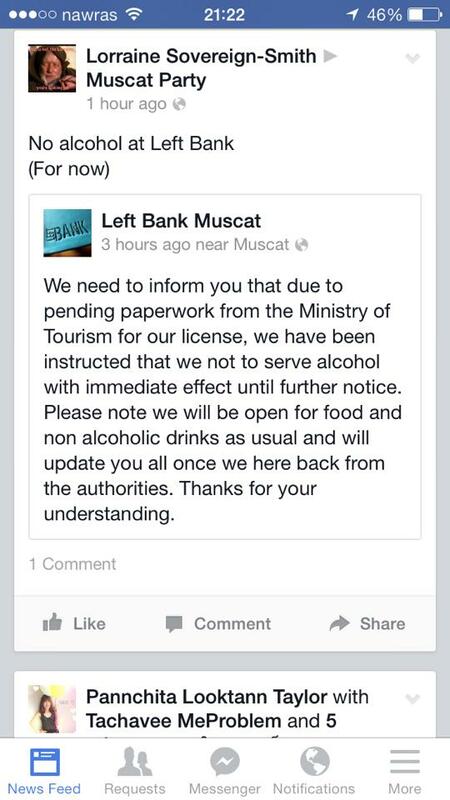 Left Bank Muscat-is it beginning of the end? Everybody knows Left Bank.One of very few bars in the city of Muscat where you can get a drink a meet fellow expats.This place also serve the food but most people used to go there to get a drink or two. Now i got a message from LB saying they lost alcohol licence and currently are ”dry”.As i have never been a big fan of their restaurant,I’m just guessing:Are the people going to dine there even though they won’t serve drinks anymore? The management of LB announced that they’re waiting for a renewal of their licence.I think they’re going to face a huge reduction of the clients as most of the people go there for a pint/drink.It would be sad Muscat would loose another bar. This entry was posted in Uncategorized and tagged alcohol licence, bars in Muscat, Left Bank Muscat, Oman. Bookmark the permalink. 2 Responses to Left Bank Muscat-is it beginning of the end? Was there last night (21 May 2014) so must have got their licence renewed as definitely serving drinks. Surprised you don’t think much of the food – our dishes were absolutely wonderful. Hi Michel,thanks for reply and informing us that Left Bank has renew it’s licence. I didn’t like the food in LB,I’ve been there only few times.What is more we went there as a group of people celebrating somebody’s birthday party and having dinner.To our surprise we were told that they won’t serve us the food as the chef was busy.!! !I hope customer service in LB had improved since my last visit.